Walk the Talk: How can women tackle hate crime? Communities Inc (working in partnership with Nottingham Trams) have been given use of the kiosk at the Clifton South tram stop. This is now rebranded ‘Communities Hub’ and we’ll be using it as a meeting point for activities that bring people together. a diference – a walking dialogue. 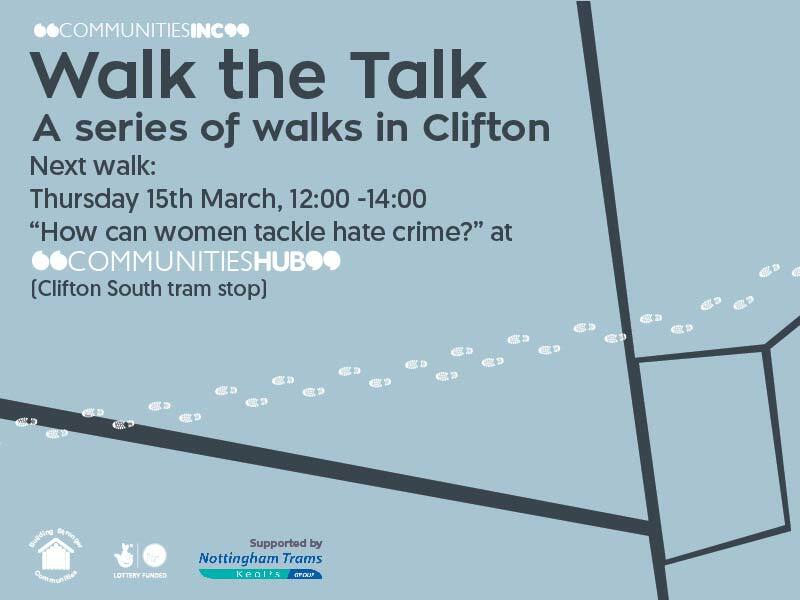 While exploring landscape and wildlife of the Holme Pit and Clifton Woods, you will be asked to reflect upon our latest inquiry – How can women tackle hate crime? Facilitators will be on hand to encourage discussions and at the end of the walk will provide you with a drink, a biscuit or two and record key points discussed during the walk. Those travelling to the event by tram will be entitled to purchase an ‘event ticket’ at a reduced price but to do so your place must be booked beforehand via Eventbrite and your receipt shown to the ticket inspector if requested. It’s time to walk the talk. Please wear sensible footwear and clothing. Make sure you arrive early, as we are leaving the Communities Hub at 12:10.